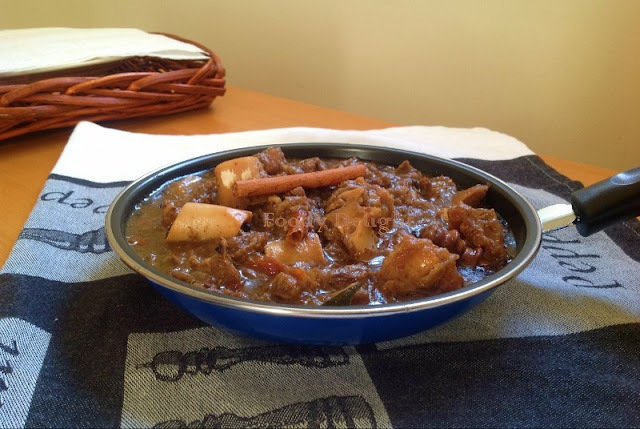 Khara Masala Gosht is one of the traditional northern cuisine of India. 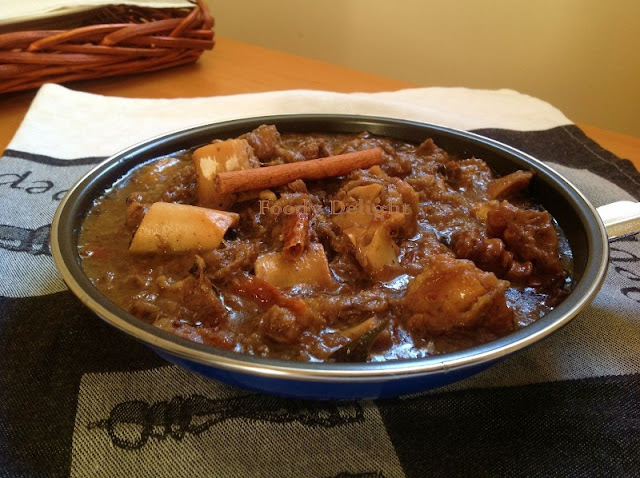 Khara masala are the whole spices which includes cloves, cinnamon sticks, black pepper, black cardamom, green cardamom, bay leaves and gosht means the meat (mutton/goat meat). So the name of the recipe itself says that the goat meat is fully cooked in and with whole spices. Cooking process is bit lengthy. As I said here firstly meat is cooked with whole spices and then simmered in same whole spices. Believe me this masala ghost has awesome taste and flavor. Try it once and I am very sure you all will like this dish. Put all the ingredients into the pressure cook in this order -Onions, dry spices, meat, ginger and garlic , oil. Then place the pressure cooker on high flame for 13 to 15 minutes. And wait till you listen 3 to 4 whistles. Turn off the flame and wait till all the pressure releases out. Or you can place pressure cooker under running water. This allows the opening the lid while the contents are still hot. 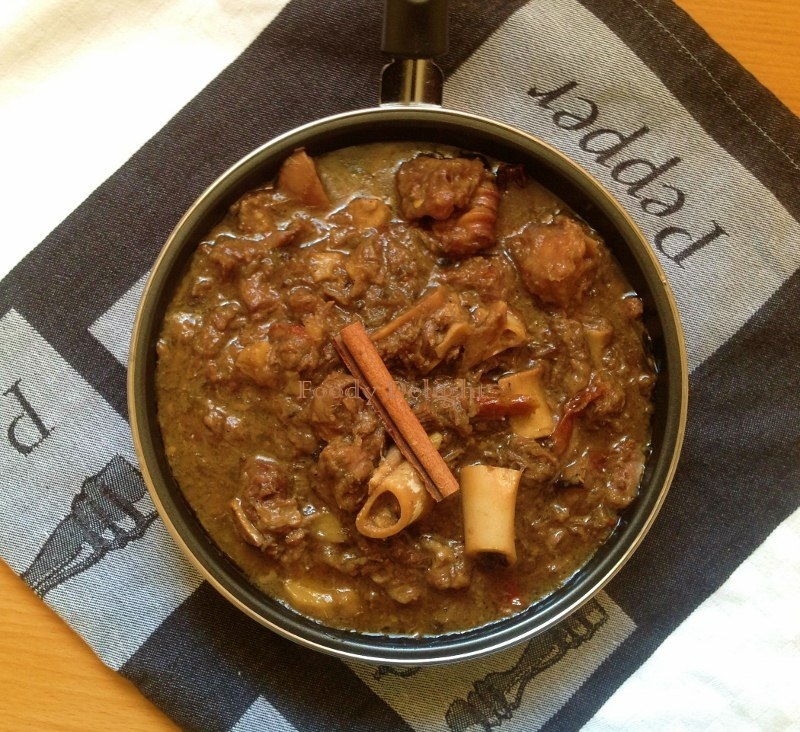 Transfer the cooked meat from pressure cooker to a pot and place on medium flame. After sometime you can see that gravy getting dry and also oil separates out from gravy. Keep scraping the dry gravy sticking it from bottom of the pan by adding 1 tbsp of water at a time. You can do this process upto 3 to 4 times. Avoid any burning at the bottom. At the end of the browning process, add 1 cup of hot water and reduce the flame to lowest setting. Cover the pot and simmer it for 20 minutes . About halfway of simmering process, add 1 tbsp of ghee to the gravy and continue with simmering. Khara masala ghost is ready to serve with paratha .